This produced the caldera (sea-filled crater), now overlooked by the whitewashed, cliff-top settlements of Fira (the capital) and Oia. Featured on countless picture postcards, Fira and Oia cater primarily for couples on romantic escapes, and therefore popular wedding and honeymoon destinations. Cruise ships put down anchor in the caldera and passengers are taken ashore on tender boats to Skala, below Fira. They then ride up to town by cable car or mule – athletic types can choose to climb the 580-step footpath. 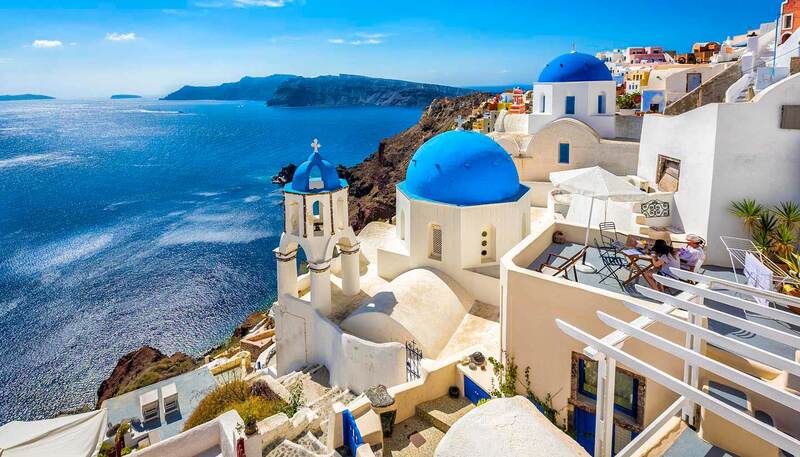 The most stunning of Greece’s Cycladic islands, Santorini gained its present appearance when a volcanic explosion blew out the island’s centre some 3,600 years ago. Fira’s winding, cobbled streets are packed with small hotels, restaurants and cafes, the most memorable (and most expensive) affording caldera views. There are also a couple of museums. Cruise companies offer a range of excursions including up-market Oia, noted for its typical Cycladic architecture and unforgettable sunsets, and the tiny charred islands of the caldera, known for their therapeutic volcanic muds. Connoisseurs might also visit the Boutari winery for a guided tour and wine-tasting session – Santorini makes some of the Greek islands’ best white wines and Boutari is the island’s largest producer. One of Santorini’s top attractions, Akrotiri archaeological site, is unfortunately closed for restoration, and looks unlikely to reopen before 2010 or 2011. Tel: +30 228 602 7199. In Fira, shop for gold and silver jewellery, hand-blown glass, painted ceramics, leather goods, replicas of ancient Greek artworks, and contemporary paintings depicting the island. Buy local white wine and Vin Santo (dessert wine) direct from the wineries, tasting first before you make your choice. A cheap and cheerful memento for the bathroom is a pumice stone. Greek cuisine is based on fresh, seasonal, Mediterranean ingredients, with the abundant use of olive oil. Popular main courses include simply prepared fresh seafood, plus charcoal-grilled meat and hearty stews. The Mediterranean cruise season runs from late April to late October. Peak season in Greece is July to August, when all the main destinations are very hot and very crowded. Try to visit in May/June or September/October to avoid the crowds and enjoy milder weather.